The old saying, “Necessity is the mother of invention” could be applied to Council Bluffs, Iowa’s, public works department as challenges faced in a high water table neighborhood created the need for them to think outside the box for solutions. City Engineer Matt Cox explained the city has been working on a multi-phase project to correct wastewater and drainage issues in the East Manawa neighborhood. According to Cox, when the neighborhood was developed in the ’70s, it was not within the city limits, so it likely didn’t have to comply with the same standards as developments within the city. “Our current residents expect higher standards,” Cox said. Mayor Matt Walsh said he believed the development was annexed into the city limits sometime in the ’80s. Council Bluffs is in Pottawattamie County and is located on the east bank of the Missouri River across from Omaha, Neb. The United States Census Bureau estimates that as of 2016 the population is around 62,544. 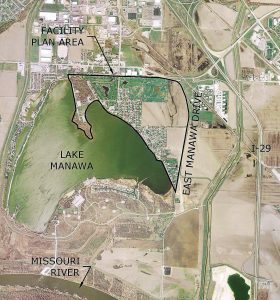 The East Manawa neighborhood has nearly 500 homes and is adjacent to Lake Manawa State Park. Cox said it was a flat area with no storm sewers and high water tables. The neighborhood is nearly surrounded by water as besides the lake it also has the Missouri River on west side and Mosquito Creek on another. “When it rains there’s nowhere for the water to go,” he said. Even more challenging was the narrow right of way they had to deal with. Cox said they were dealing with older utility lines for gas and water and some cast-iron pipes. “This is a tight neighborhood for right of way — very narrow,” Cox said. “There’s only 30 feet for the street and utilities.” So, they got creative with thinking about what type of sewer system to use if not the traditional gravity sanitary sewer system, which would mean having to do a lot of de-watering, “which would be expensive,” Cox said. They considered low pressure systems with pump grinders, septic tank effluent pumping systems and vacuum pump systems. “We selected the vacuum sewer — we could place it relatively shallow — but it had never been done in Council Bluffs before,” he said. The city engineer said they had to do a lot of work to convince the Department of Natural Resources that this was the best way to go — it helped that it had been done in the state before. They had to come up with a plan and document all the challenges they faced before receiving an okay from the DNR. Cox explained that a traditional gravity line carries the wastewater from the residence to an AirVac valve pit package. When 10 gallons of wastewater fills the valve pit, it opens and differential pressure propels the contents into the AirVac main. The main is laid out in a sawtooth manner to ensure proper vacuum pressure. The wastewater then enters the collection tank, and when that fills, it is transferred to the treatment plant via a force main. The vacuum pumps cycle on and off as needed to maintain a consistent level throughout the system. “From the homeowner’s standpoint, it’s no different,” he said. 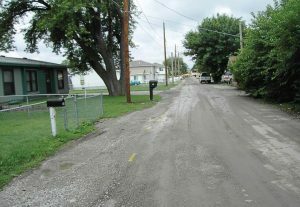 The public works department typically ties two houses together on one line. Benefits to the system include the allowance of laying pipe shallow so there’s less excavating. The system also eliminates the need for all the lift pump stations a gravity system would require. “Now we’re putting all the power at one central location,” Cox said, saving money on electrical costs as well as the building costs of additional pump stations. When it came to cost, the department looked at all the options for not only upfront costs, but also costs projected for a 20-year life cycle. Cox said had they gone the grinder pump route, it would’ve been more expensive, and maintenance-wise, they could be replacing hundreds of them at a time. “None of the options were cheap,” he said, but added that the vacuum sewer system came in around mid-range, and when looking at the long-term cost of maintaining one large station versus multiple stations and the simple piping required, they broke even on the sanitary sewer costs. “It solved a lot of challenges we were having, and it wasn’t any more expensive,” Cox said. He admitted there were some concerns about using this system in the cold Midwest but said the pipes are installed at 5 feet below the freeze line. He said AirVac is located in Indiana, and they gave him a whole list of cities where the system has been installed. The secondary issue for the area was storm drainage, and since Lake Manawa is highly used for recreational purposes, the city wanted to eliminate any potential pollutants from storm drainage finding its way into the lake. 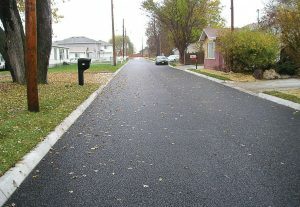 The porous asphalt acts as a filter for the stormwater and the large rock base makes it cleaner before it discharges. “Normally, there’s a 6-inch rock base under the street, but with porous asphalt we have 18 inches, and the rocks are larger with more voids and gaps,” he said. The stormwater drains through the asphalt into the rock base and is collected through slotted piping before entering the discharge station, he explained. Porous asphalt is more expensive, but Cox said the city gains by not having to have as many manholes in the street for drainage. The porous asphalt is used more in southern coastal areas so one concern officials had was would it work and hold up in the Midwest with the cold winters? In fact, the city discovered a secondary benefit for the porous asphalt, namely it stays warmer so it melts snow and ice faster — clearing the streets faster. Because this is such a large neighborhood the public works department has to phase the project out. Cox said phase one began in 2010, and the city is now working on phase five. The project will likely go through 20 phases before it is all completed, possibly taking another 15 years since workers have been able to complete a phase per year in recent years. The cost has been roughly $1 million a year. “I expect we’ll likely exceed $20 million before it’s all done,” Cox said. Mayor Matt Walsh agreed this was a challenging area because it wasn’t serviced by typical infrastructure — it was streets with ditches — and repeated that when there was a heavy rainfall there was nowhere for the water to go.